Stepping into the malayalam film industry with 'Chacko Randaaman' featuring Kalabhavan Mani, young film maker Sunil Karayattukara is making a return with his second venture after 7 years. This time Sunil has come up with an excellent story which features the young generation actors in lead. With Asif Ali and Biju Menon donning lead roles, Aju Varghese, Vishnu Raghav, Anjo Jose, Sajid, Shine Tom Chacko, Malavika Sai, Sajid Yahiya, Apoorva Bose , Renji Panicker and Ambika Mohan would also be seen in the movie giving life to other prominent characters in the movie. Scripted by Sreejith N and Rajesh Rajendran, 'Pakida' is being produced by Sagar Shereef and Kartha Seagulf. 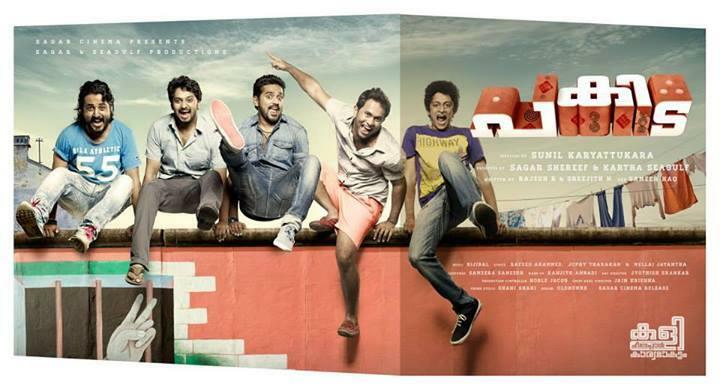 'Pakaida' revolves around the life of five friends Aadi (Asif Ali), Rafeeq (Vishnu Raghav), C P (Aju Varghese), Pauly (Sajid), and Balu (Annjo) who are graduates in automobile engineering. These five are too close to hearts and used to share their time between them. Aadi spend a part of his day sharing the time with his lady love. During the middle of his life, Aadi gets acquainted with a middle aged man George Koshy Anthrapper (Biju Menon) who walks with the help of a walking stick. Once, Aadi had to accompany Anthrapper on a journey to Rameswaram via, Kumily, Kambam, Theni, and Madhuri. During the trip, they meet Sunny (Shine Tom Chacko) and a Tamil girl Kani (Malavika). The presence of the two brings the real twist in the story of the movie. Rest of the story takes the viewers to the next phase of excitement and thrill. The director guarantees complete entertainment to the movie lovers. For the lyrics of Rafeeq Ahmed and Nellai Jayanth, the tunes will be set by Bijibal. After the final cut, 'Pakida' would reach theatres on 20th November. Some of the upcoming movies featuring young actors in lead are ‘Bicycle Thieves’, ‘Third World Boys’ and ‘Starring Paurnami’.